Heat closed contact grill 5 minutes. When grill is heated, place bacon on bottom grill surface. Close grill; cook 4 to 6 minutes turning once, until crisp. Drain on paper towels. Coarsely chop bacon. In medium bowl, mix squash, bell pepper and 1/4 cup of the vinaigrette dressing to coat. With slotted spoon, place vegetables on bottom grill surface; reserve dressing. Close grill; cook 3 to 5 minutes or until crisp-tender. Remove vegetables from grill. Add turkey to reserved dressing in bowl; toss to coat. Place turkey on bottom grill surface; discard dressing. Close grill; cook 3 to 5 minutes or until turkey is no longer pink in center. Arrange spinach on individual serving plates; top each with vegetables and turkey. Drizzle with remaining 1/4 cup vinaigrette dressing; sprinkle with bacon. For variety, use 2 boneless skinless chicken breasts instead of the turkey. 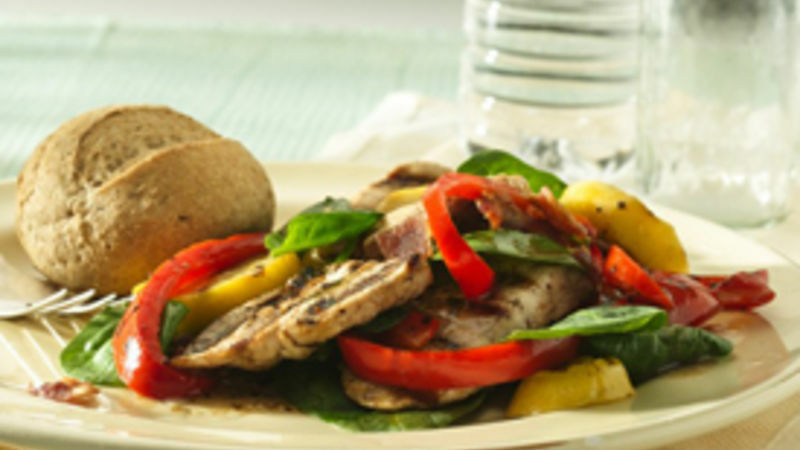 Cut each chicken breast into 1/2-inch-thick slices. Cook bacon in closed grill 7 to 9 minutes. Continue as directed above.